Really, what better birthday present for a special needs mom like me than an IEP which lasts less than an hour, in which the appropriateness of my child's placement is not only confirmed but emphasized, in which all OT and speech services are approved without incident, and in which everyone at the meeting is pleasant? The IEP was formal evidence of what Supervisor M and I already know: that Leelo's school is the right place for him to be. His staff is highly trained and experienced. Everyone in his classroom loves him. They understand him. He loves being there. It only took them about a week to "get" Leelo his quirks and behaviors and needs, and help him feel comfortable enough that he could use the classroom as a learning environment. He never really reached that "learning" point in any of his previous educational settings; everyone always seemed to be at battle stations rather than at desks or in chairs. 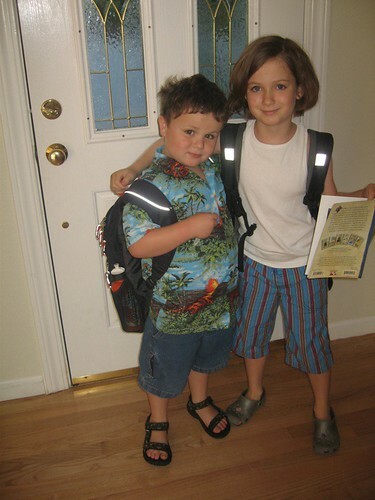 Here is he is with Iz on his first day of school. Maybe he could tell that his year was going to start out well. Everything is not totally golden; while his classroom staff is amazing, the class does not have a permanent teacher. We're even on our second short-term sub, as that position is legally limited to twenty days or fewer. It is unlikely that his class will have a permanent teacher or long-term sub before December or January. But both subs have been talented, have been veterans who grokked Leelo almost on sight. (The first one even greeted him with a box of straws on his second day of school.) That first sub thinks Leelo will most likely be able to transition to an integrated campus, because he is so genuinely social and really is capable of learning in the proper environment. Nice to hear, as right now in this most severe of schools, he is one of only two children in his class requiring a full 1:1 aide (this is due to the intensity and structure of his program in order to meet/track his IEP goals, to manage his behavior plan, and to help him learn to occupy himself without full-time supervision for more than a couple of minutes). But I think it will happen. Happy happy indeed.